Who knew that the orange box of baking soda that you can pick up for around one dollar at your local store had so many uses. Talk about a cheap alternative to simple things like stove cleaner and bath water softener. Baking soda isn’t just for baking and actually has well over 100 uses that doesn’t include putting it into an oven in any way. Below are 10 uses for baking soda that I implement in my own household. This is one item you don’t want to run out of because of it’s versatility. I can pick up the store brand for way cheap and when I know it’s going in my toilets I can feel good that it’s good for my system and was dirt cheap. 3. Antacid – April drank this constantly while she was pregnant. 8 oz of water with a teaspoon of baking soda (lemon for a little extra flavor?). While I don’t think this tastes the best drink, it down fast and it is a great antacid. 4. Bath Soak – Mix 1 cup into your bath water to really soften up your skin. The chemical bubbling action does wonders for the skin. 5. Remove odors from your hands by using baking soda as an abrasive. Pour a little in your hands with a few drops of water (enough to make a thick paste). Rub together in your hands thoroughly to bring back that clean smell. 7. Carpet cleaner – Sprinkle some into your carpet and let it sit for ten minutes. It will soak up the odors from your carpet and then vacuum up. Bonus use it will keep your vacuum bag smelling cleaner as well. 8. 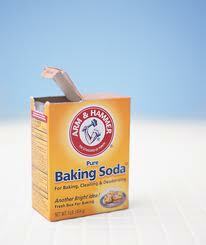 Keep your liter box smelling fresh with some baking soda added to the mix. 9. Wash your fruits and vegetables with a dab of baking soda (thin paste) to rub off any of the chemicals left on the skin. 10. Add 1 cup of baking soda to your toilet bowl. Allow to soak for one hour and then clean with your toilet brush. Easy and cheap toilet cleaner! What do you use baking soda for besides in recipes? Which tip above can you not wait to try out? Oh wow! I never knew it helped with fruit and flowers too. Thanks for the tips!! Thanks for sharing this, I love using pantry stuff to clean. Wow, I never knew half of those!! I will definitely have to keep that in mind. Great tips! I love those tips. Thank you for sharing! I am most looking forward to the toilet bowl cleaner and drain cleaner ideas. The link for the glass stove top cleaner isn’t working. I would love to see how to use baking soda for that, too. Thank you for the comment. I have fixed the link to the homemade stovetop cleaner and you should be good to go. This is one of my favorite tips actually. Enjoy and have a splendid week!